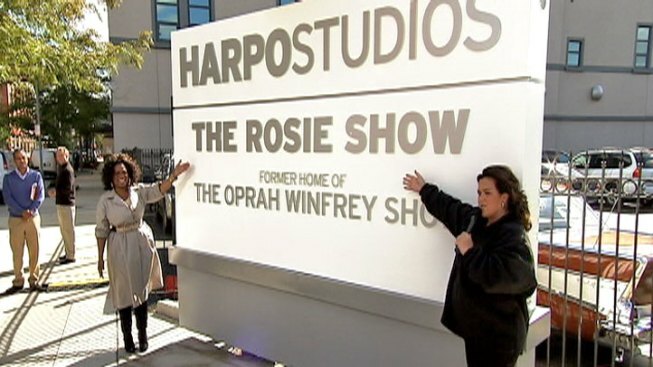 "The Rosie Show" gets top billing at near west side studios. Nearly five months after launch, Rosie O'Donnell's Chicago-based talk show has shifted gears in an effort to boost eyeballs. The show, which had been taped in the massive studio vacated by The Oprah Winfrey Show, has moved into a smaller, more intimate area. As a result, about 30 employees have lost their jobs, Crain's Chicago Business reported Friday. "What's going on with the show is what goes on with a lot of shows — they evolve over time to better deliver upon what viewers' and advertisers' expectations are," the publication quoted consulting producer Scott Carlin as saying. The changes follow the departure last week of Lisa Erspamer, the executive vice president of production and development at OWN, The Oprah Winfrey Network. Her ouster was first reported by entertainment magazine Deadline.com. Winfrey ended her show last May and left the West Washington Boulevard facility for digs in Los Angeles, where OWN is based in a partnership with Discovery Communications. O'Donnell recently purchased a home near Wrigley Field, shortly before her show's Oct. 10 debut.